Oh, hey, it’s that jumpsuit again! It’s funny how certain outfits that I share extend the conversation about what we wear beyond this space. Since posting the last styling of this black jumpsuit, I’ve talked to a surprising amount of people about wearing jumpsuits and rompers. I learned that I’m not the only one to struggle to find the one that works, or the only person to wonder if they could “pull it off.” Hopefully, if you were in that camp, you’ve tried one out by now because honestly, I love both jumpsuits and rompers a bit too much. 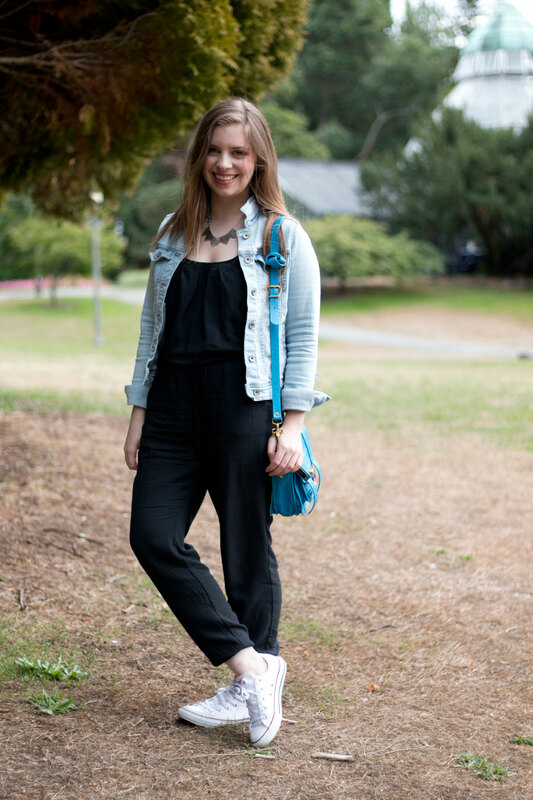 What I like about jumpsuits (and rompers for the warmer months) is how easy it is to dress them up or down. It’s like a black dress, but a bit more fashionable. I truly regret not packing this jumpsuit for France because I saw so many chic women wearing them! Granted theirs were probably not from Sears, but what can I say, I like budget fashion! 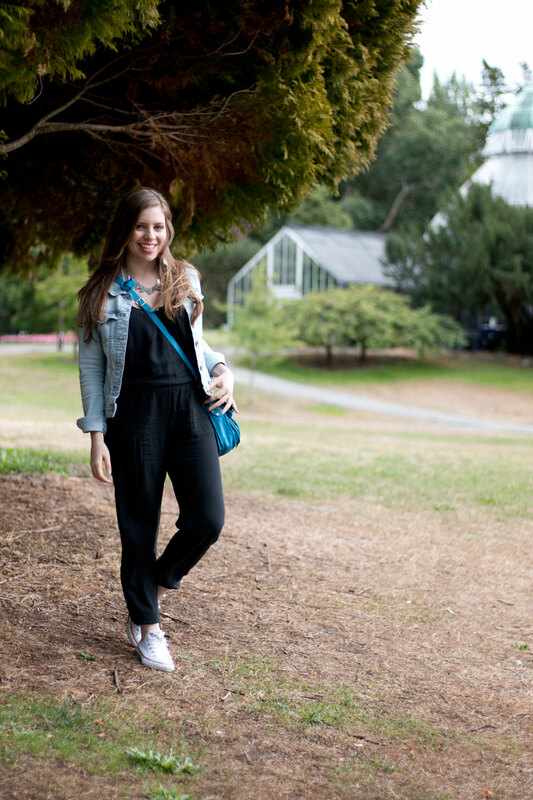 I wore this jumpsuit to go hang out with my friend and fellow blogger, Hilary of Cutie Cameras. Unfortunately as soon as we started snapping photos the wind picked up and decided it was going to make outfit photos that much more difficult, so excuse the unintentionally popped collar and flyaway hair. ;) Blogger problems, for real. Have you styled a piece you were hesitant about recently? What are your thoughts on jumpsuits and rompers? I’d love to hear about it – and happy weekend! I just bought a black jumpsuit from J.Crew and am excited to wear it out. I feel like it’s the first time I haven’t looked like a car mechanic in one! Love your bag! Haha, the wrong styles can definitely look a bit uniform like! ;) Thanks Priscilla! seriously, this jumpsuit is adorable on you. love the denim jacket with it! It was so fun hanging out with you!! It’s too bad the weather turned right when we were trying to take photos. Darn Washington weather! Haha, seriously though! Hopefully we have good weather this weekend! Thanks Shannon, agreed, black is so easy to wear too! Love this look! Denim sure is making a comeback! Cute! I definitely found my love of rompers this summer and I’m way on board the jumpsuit and jacket trend for Fall. 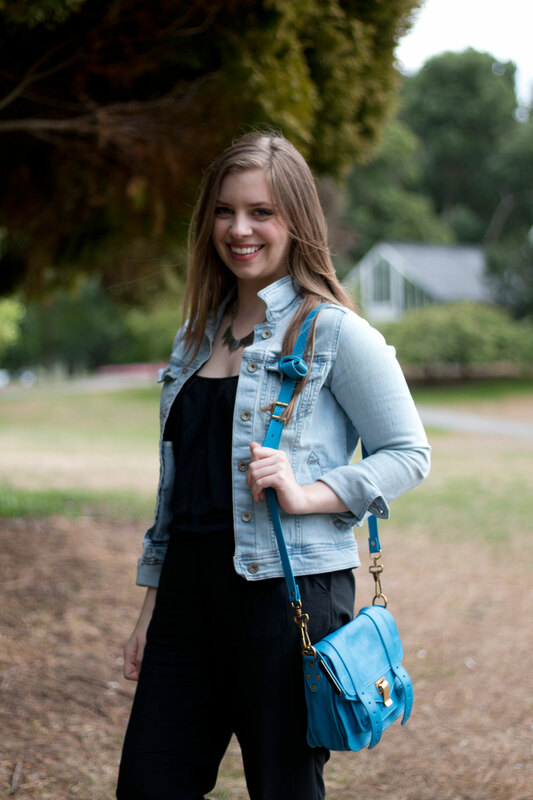 Yes, I can’t wait until fall – I know I’ll be wearing this combo even more often! Rompers, I love, but I’m not sure if I could pull off a jumpsuit! in theory it’s the same idea! I love that you style pieces differently in your blog posts; it goes to show everyone how you don’t need 10 different rompers when you have one really great one that can be paired with different accessories/pieces to create different looks! Cute cute cute outfit Jenn! I love that you can style this jumpsuit so many different ways and dress it up with heels or down with converse and a denim jacket like you did in these pictures. I’m pro Jumpsuits/Rompers too lol:). When you find one that fits right, you have to buy it! Thanks Rita! Agreed, love the versatility of pieces like this! I really like yours paired with converse. I’m always concerned that I need to wear heels or wedges with jumpsuits since I’m short, but maybe I just need better cut jumpsuits haha. Thanks Maddy! I felt the same way and then just felt like wearing sneakers so decided to give it a try. I ended up really liking it – the nice thing about this one is it has cuffs that I feel like are conducive for folding under and wearing flats or sneakers!